Shopping in New Orleans is very much geared towards the tourist, with an abundance of shops selling souvenirs. You can’t walk more than a block in the French Quarter without hearing the blaring zydeco music of the gift shops, though outside the main tourist areas are opportunities to pick up items which are a little less populist. 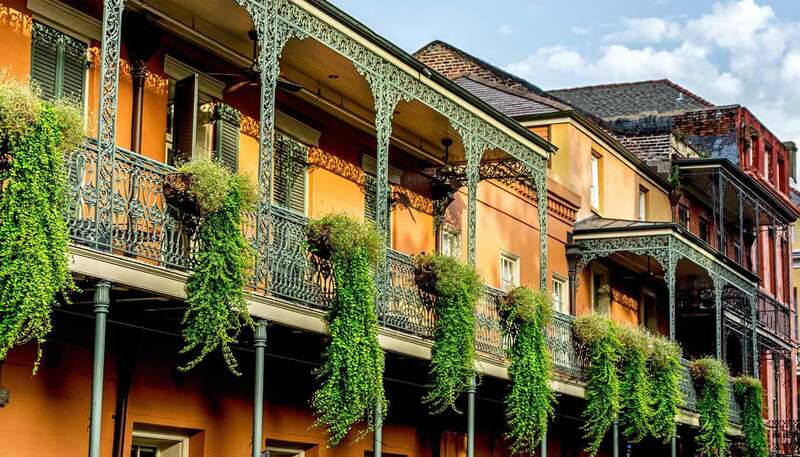 In among the plethora of glitzy T-shirt and plastic bead shops that blast out bad zydeco music, the French Quarter has plenty of unique craft shops, galleries and other stores. It houses art galleries and antique shops on Royal Street, and boutiques and gift stores on almost every other street. The Central Business District (CBD) and Uptown are also good shopping areas, with most of the high-street chains having branches in and around the local businesses. For more upmarket items, there are the many antique shops on Royal and Magazine Streets. Magazine Street is one of the city’s most thriving neighbourhoods, and has a mixture of fashionable and funky shops, hip boutiques and galleries. You can grab a cup of coffee and a pastry at a local café before rummaging through antique stores for trendy boutique purchases, toys and chocolates. Running for several blocks along Decatur and North Peters Streets, the historic French Market, open daily 0800-1830, has been one of the most colourful spots in New Orleans for centuries. The large covered sheds house the Farmers’ Market, where fresh produce is sold, and the Flea Market, with clothes, jewellery, hot sauces and other souvenirs. There are also a number of food stalls, from local favourites such as po boys to organic stalls with smoothies and salads. The Shops at Jax Brewery is a large, newish mall on the waterfront in the French Quarter. Other shopping centres include the upscale Shops at Canal Place, where local artisans such as high-end jeweller Mignon Faget have outlets. The Riverwalk Marketplace is large but never seems to attract a high enough footfall to make it seem lively, though the food court has some good choice. New Orleans Shopping Center and Lakeside Shopping Center are a couple of other options for mall shopping. French Quarter shops and galleries generally have the longest hours of operation, from Monday to Saturday 1000-2200, though on Sundays many close at 1700. General shopping hours in the city are daily 1000-1700. The vast majority of out-of-town visitors are mainly interested in the (fairly tacky) T-shirts, carnival beads and New Orleans-branded souvenirs that permeate the hundreds of gift stores. There’s also a strong market for local produce, such as hickory coffee, hot sauce and rum. New Orleans’s sales tax is 9.5% and refunds for that percentage of the price of goods purchased in tax-free stores are available to overseas visitors at the international airport’s LTFS (Louisiana Tax-Free Shopping) Refund Centre. The LTFS voucher and sales receipt are required, as well as your passport and international air ticket. Refunds under US$500 are paid in cash, otherwise a cheque will be posted.